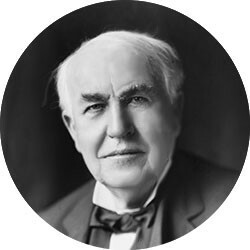 Thomas Edison Famous FailureThomas Edison is an American inventor and entrepreneur born in 1847 in Milan, Ohio, one of seven siblings in a very large family. Edison was home schooled by his mother and developed hearing problems early on in life. He was trained to use the telegraph after a train almost struck the son of a station agent who was so grateful that he taught Edison how to use the system, eventually leading to a job working for Western Union.